Your three-year-old is becoming his or her own little person. No longer a toddler and not quite a “big kid,” three-year-old have longer attention spans than they did a year ago. They can play more games and have vivid imaginations. 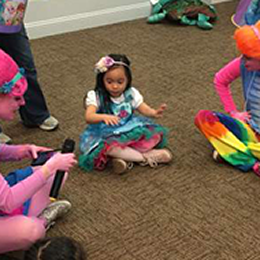 If you choose, we’ll engage your child and guests in fun songs, stories, and circle games. With our 15-foot interactive theatre, the young party-goers can enjoy dancing and musical instruments. Three-year-olds are big fans of our indoor playground equipment, too. They can climb more easily now and may enjoy a pint-size indoor obstacle course. We have castles, slides, schoolhouse, a caterpillar to climb through and a playhouse that three-year-olds enjoy. We can also lead the children in simple craft projects. Our energetic hosts will keep up with three-year-olds and provide constant entertainment. Your three-year-old will likely want to choose his or her own party theme this year! Kids Kustom Parties in Palatine, IL has a vast repertoire of fun birthday party themes to choose from! Looking for a character party? We can provide two related characters, such as Buzz and Woody from Toy Story, Batman and Batgirl, or Cinderella and her Fairy Godmother. Alternatively, we can divide the room and provide two “separate” parties. For example, we can offer a superhero experience on one side of the room and a princess party on the other. This often works well when your three-year-old has siblings with different interests. It’s also great for multi-age and multi-gender parties. Please note that some three-year-olds, similar to two-year-olds, may still be uncomfortable around masked or “scary” characters, such as the Evil Queen, Darth Vader, T-Rex, or Beast from Beauty and the Beast.